Daisho Con 2018 will be held at the Kalahari Resort Convention Center in Wisconsin Dells, WI! Kalahari features 750 beautifully appointed authentic African-themed guest rooms and suites. Choose from comfortable Guest Rooms that sleep from 2-6* guests, roomy Two Bedroom Suites for up to 8* guests or incredible Three to Ten Bedroom Suites that include a full kitchen and more! Guests for Daisho Con will also receive waterpark passes! Call the Kalahari Resort and tell them you would like to reserve a room under the Daisho Con group rate. Daisho Con’s room rate is competitive with other conventions, and you can save more because our rooms are rated for more people! Check out our standard rooms, or take a peek at the combination rooms and suites if you want awesome furnishings with room for your larger groups! 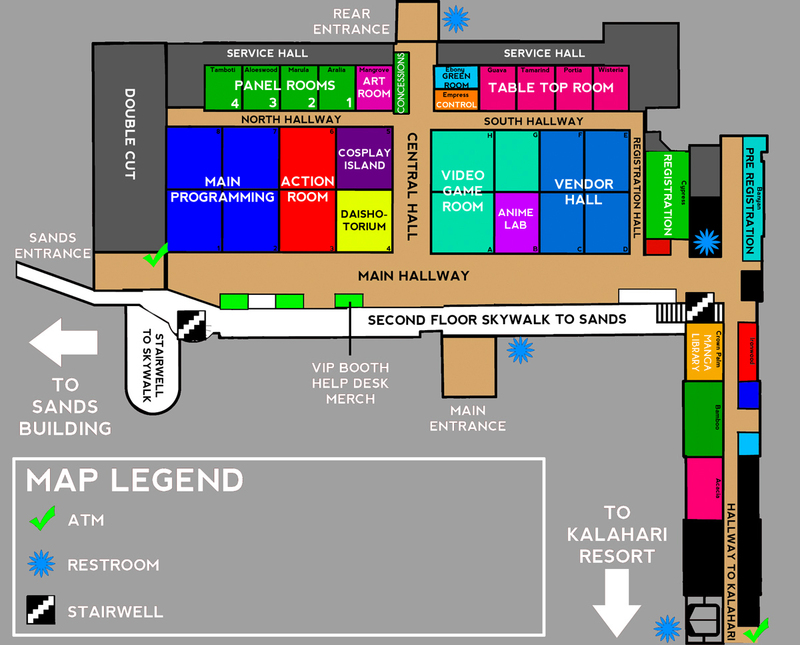 The Daisho Con Room Block at the Kalahari is almost sold out for 2018! We apologize for the inconvenience. Look below for our overflow hotels and room rates that are available! Although the Daisho Con 2018 room block is closing, there are area hotels that have partnered with Daisho Con this year to house our convention attendees at a special rate! Is a deposit required at the time of reservation for the Kalahari? Yes, Kalahari is an advance deposit Resort requiring the first night’s lodging plus applicable taxes and resort fee to be charged at the time of reservation. Do water park passes come with my room at the Kalahari? Yes, each room comes with 4 waterpark passes for each day you stay at the Kalahari. Some larger rooms may come with additional waterpark passes if you have additional registered guests. Please note that only the indoor waterpark will be open during Daisho Con due to weather. Can I use the water park without staying at the Kalahari? Yes, you can purchase waterpark passes online or at the waterpark entrance. Can I wear my cosplay to the water park in the Kalahari? If the costume is made to be swimwear, you may wear it to the waterpark. However, no wigs, body paint, props/weapons, excess accessories are allowed in the waterpark area. Hotel and waterpark rules must be followed by all attendees. Is the theme park included with my Kalahari reservation? No, theme park passes are separate and may be purchased at the Kalahari. Is there internet at the Kalahari? Yes, there is free wifi available in the hotel rooms.